Scientists have wondered for decades why mammals’ brains are so large relative to their body size, but for the most part all they could do was guess. The fossils that could give paleontologists clues to the earliest development of the mammalian brain are hard to come by, and the in-depth study that would offer better clues meant destroying 190 million-year-old fossils from China. It wasn’t worth the cost, so researchers were left to guess, relying primarily on comparative studies of living mammals. However, advances in technology—in particular the use of computed tomography (CT) technology similar to medical scanners—have for the first time allowed scientists to reconstruct the Jurassic-era fossils, giving them a glimpse—literally—into the brains of these early mammals, and giving up some of the secrets of their earliest brain development. According to a research article published last month in the prestigious journal Science, an improved sense of smell was the main factor in the development of mammals’ large brains. This is extraordinary news for the scientists trying to learn more about the development of mammals, and extraordinary news for St. Mary’s University. As it turns out, one of the three authors in this monumental scientific breakthrough is St. Mary’s Assistant Professor of Biological Sciences Thomas E. “Ted” Macrini, Ph.D., who joined the St. Mary’s faculty in 2009. The Science article is born of Macrini’s doctoral dissertation work, which he conducted along with Tim Rowe, Ph.D., professor in the Jackson School of Geosciences and director of the Vertebrate Paleontology Laboratory at the University of Texas, and Zhe-Xi Luo, Ph.D., curator and associate director for Research and Collections at the Carnegie Museum of Natural History. Their work on the article, “Fossil Evidence on Origin of the Mammalian Brain,” was published in the May 20, 2011 issue of Science, a major accomplishment in and of itself. While mammals first emerged about 200 million years ago, the oldest mammal fossils are mostly small jaws and teeth, and only the occasional skull. Even then, these tiny fossils are only a few centimeters long, providing no way to take a closer look without destroying them, according to Macrini. The CT technology allowed Macrini and his colleagues to not only look inside the paperclip-sized skull without harming it, but also produce three-dimensional negatives of the skull’s interior, giving researchers a new perspective. 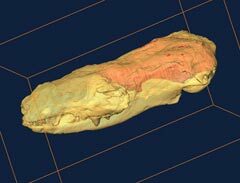 For the study, the team CT-scanned more than a dozen early mammal fossils and more than 200 living species over the course of a decade, using the High-Resolution X-ray Computed Tomography Facility at the University of Texas at Austin, which is a national shared facility supported by the National Science Foundation. The scans are archived online and freely available to the public and other researchers, allowing this technology to be widely available. So, if smell was the primary catalyst in mammals developing large brains, why do some animals, such as dogs, have far superior olfactory ability than, say, humans? Rowe explains it this way: “When you make one sense better, it is usually at the expense of something else.” In the case of humans, smell may be less prominent to make room for more developed vision and hearing abilities. Similarly, birds have traded better olfactory for improved vision, whales for better hearing, and bats for echolocation (the sense bats use to navigate in the dark while hunting). While this article in Science has brought Macrini and his colleagues international attention for their pioneering research, it’s not what Macrini does on a daily basis at St. Mary’s. 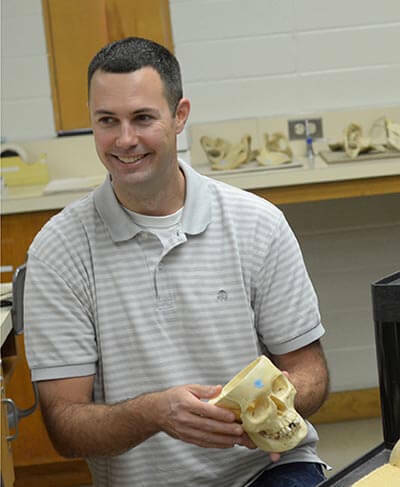 In addition to the biology classes he teaches, Macrini also leads a group of St. Mary’s students in some groundbreaking research in another field altogether: looking for causes to the pain caused by osteoarthritis. His work looks at baboons at the Texas Biomedical Research Institute, attempting to learn more about what can be done to ease the pain experienced by humans with osteoarthritis.